Looking for fresh ideas for [tag]basketball shooting instruction[/tag]? You’ve come to the right place! Try out this idea below and let me know how it goes for you. 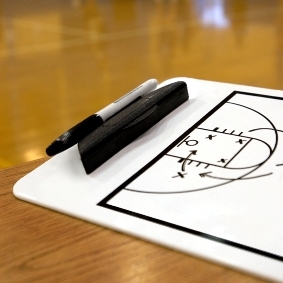 A [tag]basketball[/tag] [tag]drill[/tag] we do nearly every practice is “baseline [tag]lay-up[/tag] drill”. I [tag]coach[/tag] a grade 7/8 boys team. We get many baseline lay-ups every game; we don’t make all of them yet. The drill breaks the court into half and uses the side hoops as well. Players start in the corner using no more than 3 dribbles they must attack the hoop along the baseline with their last [tag]dribble[/tag] they must “jump back” into the court to square up to the backboard jump up high and make the shot. After rebounding the ball player dribbles to the next corner and repeats the lay-up shot. After this [tag]rebound[/tag] the player then has a full speed lay-up at the hoop across the court. Change directions and both left and right hands are used. Once players are comfortable doing this many adaptations can be implemented. One is adding [tag]defense[/tag] and boxing out. The defensive man waits in the key to challenge the shot [tag]offensive[/tag] player draws contact and scores with a strong move. The defensive player must box out and rebounds becoming the offensive player dribbling to the next corner. After scoring the offensive player is now waiting in the key for the next scorer.